Messrs. Editors:—Another victim has been sacrificed on the altar of Anti-Americanism. 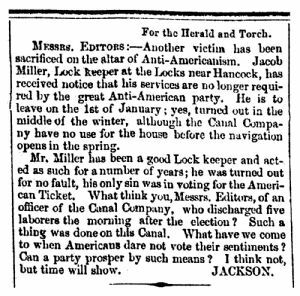 Jacob Miller, Lock keeper at the Locks near Hancock, has received notice that his services are no longer required by the great Anti-American party. He is to leave on the 1st of January; yes, turned out in the middle of the winter, although the Canal Company have no use for the house before the navigation opens in the spring. Mr. Miller has been a good Lock keeper and acted as such for a number of years; he was turned out for no fault, his only sin was in voting for the American Ticket. What think you, Messrs. Editors, of an officer of the Canal Company, who discharged five laborers the morning after the election ? Such a thing was done on this Canal. What have we come to when Americans dare not vote their sentiments ? Can a party prosper by such means ? I think not, but time will show.